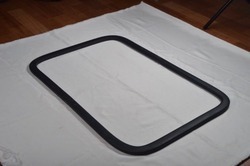 Manufacturer of a wide range of products which include Rubber Gaskets, Silicone Endless Gasket, Silicone Tri Clover Gaskets, Silicone Endless Gaskets, Silicone Autoclave Gaskets and Silicone Door Gaskets. - Temperature range : - 80 °C to + 250 °C. Tensile Strength: 3.6 to 11.0 MPa.